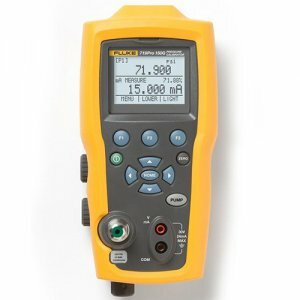 The Fluke 719PRO provides an innovative, built-in electric pump and pressure calibration that is accurate and easy to use. Now you can calibrate and test pressure devices quickly and easily with one hand, saving you valuable time. The Fluke 719Pro's programmable pump limit settings to eliminate over-pressurization, and to set ‘pump to’ pressure values. The unique cleanout port design reduces pump failures, and makes the Fluke 719Pro easy to clean without repair. The compact, lightweight form, combined with one-handed use, makes this pressure calibrator the ideal tool for busy process professionals. The Fluke 719 Pro adds a backlit display and adds precision temperature measurement with the use of a RTD probe, making the Fluke 719 Pro a very veritile Calibrator.